The electrical system in your home and office is the most overlooked of all integrated utility systems. Most people don't give it a second thought, it is just expected to work. However it can also be the most dangerous if any part of the system isn't working properly! Any electrical device, whether it be a plug, switch, light fixture, etc., not working properly has the potential to cause a fire! 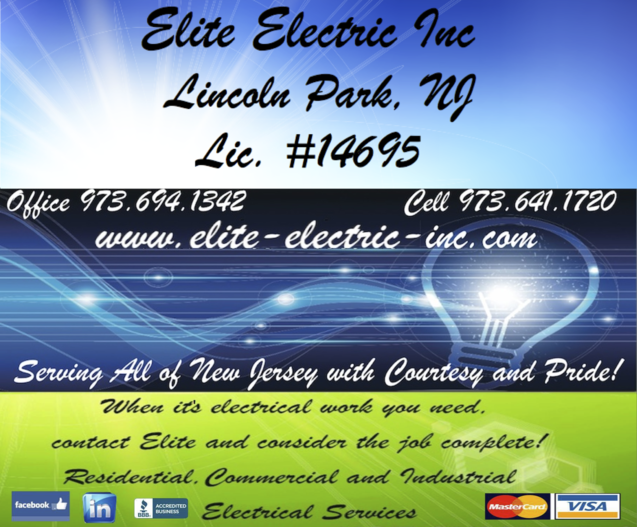 Call Elite Electric Inc. and have your electrical system inspected! It could be the best phone call you ever make! or worse, a fire could start inside the wall without you knowing about it!! Photos above indicate poor quality workmanship resulting in arching and heating up of the wire which will melt the insulation and pose a huge risk of fire. Heavy gauge aluminum wiring used for electrical services is fine! However for a period of time, primarily from 1965-1973, their were homes that had aluminum branch circuit wiring. The use of such a soft metal wire in such a small wire size can be very dangerous! 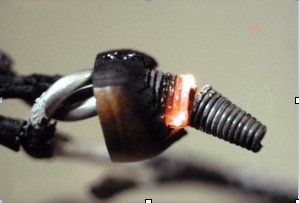 The picture below shows aluminum wires heating up and causing the wire nut to melt. An estimated two million homes and mobile homes have been constructed using aluminum wiring since 1965. To assist consumers who live in homes with aluminum wiring to reduce the potential risk of fire and the possibility of dangerous overheating, the Commission suggests the following precautionary steps. If you are not certain or if you do not know whether your home is wired completely with aluminum, ask a knowledgeable electrician or other qualified individual to make the determination. If aluminum wiring was used, have the electrician or individual check the connections on heavily loaded and constantly loaded circuits to determine if the electrical connections have been made properly or show evidence of deterioration. 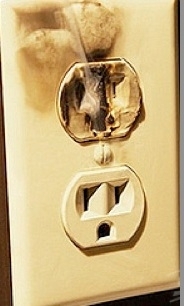 Trouble signs associated with aluminum wiring problems include: * warm switch or receptacle face plates. * strange or distinctive odor or the smell of burning plastic in the vicinity of a receptacle or switch. * flickering of lights not traceable to appliances or obvious external causes. Call us for a diagnosis of the problem. "During a typical year, home electrical problems account for 67,800 fires, 485 deaths, and $868 million in property losses. Home electrical wiring causes twice as many fires as electrical appliances." 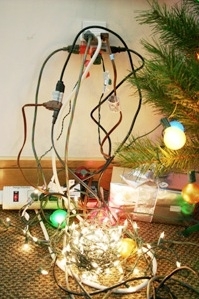 "Most electrical fires result from problems with "fixed wiring" such as faulty electrical outlets and old wiring. 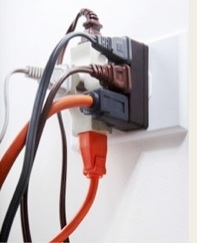 Problems with cords and plugs, such as extension and appliance cords, also cause many home electrical fires. Many avoidable electrical fires can be traced to misuse of electric cords, such as overloading circuits, poor maintenance and running the cords under rugs or in high traffic areas."